Last week (Nov 17-21, 2014) I enjoyed an archive visit to The Strong (Rochester, NY) as a Research Fellow. I spent my days photographing various Atari coin-ops and working on the museum’s Atari Coin-Op Divisions Collection, 1972-1999 (http://www.museumofplay.org/collections/video-and-other-electronic-game-collections). The complete collection is massive (22 pallets) and The Strong will employ an archivist to work full-time on processing the collection in January. In the meantime, Jeremy Saucier shared a few documents with me: a “binder full of Atari” in-house newsletters such as St. Pong, Atari Connection, Atari Life, and Atari 81. The latter title revealed a ‘happy find’–a short article on Atari’s El Paso, TX Plant, the one whose products went onto to populate the Alamogordo landfill in September 1983. In a very short time-period Atari Inc would operate three different facilities in El Paso: Atari’s VCS cartridge manufacturing plant (*1982-1983) at 11460 Pellicano Dr; Atari Distribution Center at 11500 Rojas Dr in 1984; and in 1985 Atari Inc. & Distribution Center was located at 9230 Billy The Kid Street (I’m not making that name up!). The El Paso Main Library holds records on all three locations. Atari’s personnel manager, Bill Medrano, predicted that El Paso would “become a miniature Silicon Valley by the end of the century” (p. 6)—-he’s referring to the end of the 20th century not the 21st. In 1981 the plant produced “well over half of Atari’s total supply of VCS cartridges”. “Cartridge assembly, packaging and shipping all take place under one roof” (p.6). All the employees photographed in the two-page article are women (the same seems to be the case with the employees who “stuffed” printed-circuit boards at Atari’s coin-op division in CA). Atari was involved in El Paso’s Women’s Employment and Education Association (WEEA). “The WEEA is a private program to help single mothers on welfare secure steady jobs and learn to support themselves and their families” (p. 7). The women pictured working in the plant are all Latina. “Atari has hired over a dozen of the program’s graduates, more than any other company in El Paso” (p. 7). This may explain the discrepancy in dates: Atari “is building a new 128,000-square-foot plant which will dwarf the old 38,500-square-foot warehouse. The building will be ready for occupancy in August ” (p. 7). I will assume that this refers to the location at 11460 Pellicano Dr.
Last lines of the article: “This phenomenal growth is but a reflection of the growing reputation and popularity of Atari products. The establishment and expansion of facilities outside the Silicon Valley will continue as Atari meets this demand in the U.S. and around the world” (p. 7). According to the El Paso Main Library this new plant closed two-years later in 1983. Atari’s ewaste is on the move. SInce being excavated/processed/documented in April 2014 the retrieved materials have been stored by the City of Alamogordo and branded for public auction. 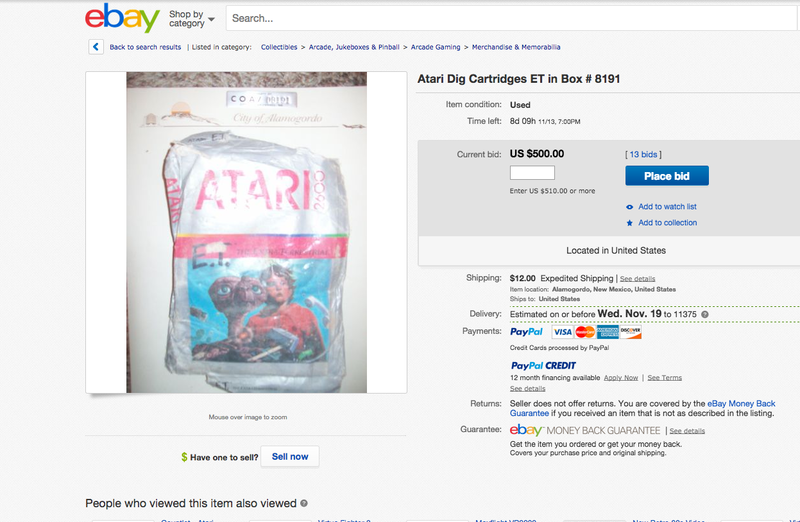 Branding and the return to a market re-values Atari Inc.’s former ewaste into collectibles sold to highest bidders. The City has packaged each item with a certificate of authentication and City property numbered I.D. tag to confirm that each item is the “real-deal” from the disposal that occurred in September 1983. The promise of a “narrative with photos of the 1983 burial and the 2014 excavation proving the legend to be true” will also be included with the winning bid. From the picture on eBay the winner will also receive a card-backing complete with the City’s logo: the New Mexico Museum of Space History pictured with the sun-setting over the Sacramento Mountains…and a Stealth Bomber. Will E.T.’s glowing finger become incorporated into the City’s letterhead? Atari’s materials crushed, mixed with cement (no layer) and other landfill, additional layers of domestic trashed dumped on top of the “Atari vein”. Atari’s ewaste is buried. References to the “Atari Burial” appears in books devoted to video game history. D.B. Weiss’s Lucky Wander Boy (2003) writes about the disposal in his novel. Personal engagement with the legend/site: first wrote on the dumping in 2006 by way of a piece for Vectors (“Ms. PacMan: An Elegy to Undead Media”), followed by a research trip to Alamogordo to meet with former Mayor Donald Carroll July 12, 2008, another research trip to meet with Ricky Jones (who scavenged Atari’s items in September 1983) on July 21, 2009, published “Concrete and Clay: The Afterlife and Times of E.T. The Extra-Terrestrial for the Atari Video Computer System” in Design and Culture 2009, published Game After: A Cultural Study of Video Game Afterlife, Jan 2014). Life in the hands of private collectors.